Rex Sinquefield is the co-founder and past co-chairman of Dimensional Fund Advisors Inc., a registered investment advisor with over $100 billion under management. In the 1970s, he co-authored (with Roger Ibbotson) a series of papers and books titled Stocks, Bonds, Bills & Inflation. These works provided the first seminal data on the performance of the financial market in the United States. At American National Bank of Chicago, he pioneered many of the nation's first index funds. Since 2003, he has served as a member of the editorial board of the Financial Analysts Journal. 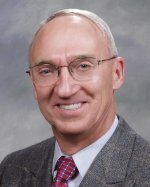 Sinquefield is a director of Saint Vincent Orphan's Home in Saint Louis, a member of the investment committee of the Archdiocese of Saint Louis, and a life trustee of DePaul University. He serves on the boards of the Saint Louis Symphony Orchestra, the Saint Louis Art Museum, the Missouri Botanical Garden, Saint Louis Opera Theater and Saint Louis University. He received his B.S. from Saint Louis University and his M.B.A. from the University of Chicago in 1972.